Metamorphic Painting is the challenge of creating an image out of other images by changing the position of the parts within the painting. I will explain the thoughts I have behind this methodology. This series of Metamorphic Paintings questions a painting being “a single image on a single screen”. The function of a puzzle, such as the gimmick, or the kids' play, was not the essence of the series. 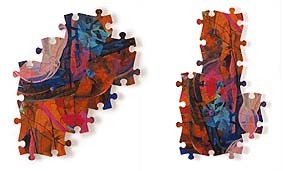 It is important to state, in the first place, that in this series of Metamorphic Paintings, the flexibility of the zig-saw puzzle form was the only importance to me. When we look at the history of tableau, the portable altar piece (which started with religious missionary work) is the origin of today's style of paintings. The religious world view, seen in the icons which transcend to the sublime, is succeeded to the production processes of todayﾕs paintings. I find it awkward how there is little attention paid to this similarity between them, because I think art has become independent from religion over a long period of time. I believe that my new methodology of art production could be added to the contemporary art production. I like to think about the independence of a painting. When I do, I question the idea that many paintings represent, or at least get their motivation from, the elements that exist outside of the painting. Sometimes the motivation of the outbreak does not exist inside of the paintings, but the paintings are merely used as ﾒthe place for developmentﾓ for the elements that came from outside of them. This is something I question. My premise for my abstract paintings is that it does not depend on the images outside of itself, or the story outside of the painting. In my idea, a painting “is independent” and “already has the elements in itself”. Only then it becomes my “abstract painting”. Through the process of painting, I intentionally create what I call the self-motivation device, that will evoke the power of images and space strongly within the painting itself. I believe the more the self-motivation device is innate, the more powerful the painting becomes. For this series, I also needed to prepare the self-motivation device. This is why I started to think of this new production method: “setting up a parallel world that simultaneously proceeds. In their interactions, a place of expression is evoked”. That is the puzzle piece method. In particular, when I attempt to establish multiple painting images simultaneously, I have to go back and forth between multiple images. This is because it is impossible to fix the world only by the speculation on either image. The influence from one affects the other, and new influences from the other come to the original one. The circumstances of each image collide with each other. The evoked images that emerge from this interactive influence actually create a production process that exceeds my control. I think this situation created a dynamism that goes far beyond my limitations. Recently, this is how I look at the world. When I placed this principle into my paintings, the result is a Metamorphic Painting. For me, the most exciting moment is when I face the emergence of a newly created image. The paintings would be more dynamic, when I could share this excitement with the audience. In order to realize this, I had to change the situation of the paintings as ﾒthe result of the act of expression.ﾓ I tried to challenge the situation by choosing the puzzle system, because it is changeable while maintaining the absolute condition of a flat surface. One status of the image that looks stable, contains another image. By changing the pieces, another image emerges. The audience could experience the emergence of the newly created image. It will diminish the time-lag between the experience of the artist and the audience. The audience can share a live feeling of the emergence of the newly created image. The limit of the paintings becomes a little broader. There has been another issue in the painting which was a problem for me for a while. The problem is the edge of the paintings. In my style of zig-saw puzzle, I was able to add the possibility to the edge of the paintings, that they imply there could be different combinations. The feeling of extension is something that the combinations could give to the audience. This feeling actually brings the audience to acquire a visual extension. A combination of the pieces enables me to create a free format of paintings. Moreover, it gives me the feeling of extension that the current format of the painting can become something completely different. My series of Metamorphic Paintings, along with the other artists who works with shaped canvas, is an effective method to challenge the rather traditional paintings that try to extend the view by using perspective drawings within the so-called painting shapes. Although there are many creative ways to place the puzzle pieces together, I feel that I can only call them as my art work in certain combinations. The transform function, with a great degree of freedom, lets other people freely change the paintingﾕs format. It is not my goal to acquire this physical freedom by choosing the transform function. It enables the viewers to change the combination freely, but the free combination of the puzzle is not part of what I consider ﾒthe painting that I have created.ﾓ I am only responsible of the combinations that I intend to be displayed. Simply put, I think people can enjoy the Metamorphic Paintings when they surprisingly find out the same painting contains different images, and the actual painting holds different things in the same things, as if a person transforms to a different person. It means to become free from the limited way of thinking, that one art work only contains one meaning or one subject.